Our second completed commission was dedicated by the Bishop of Barking on 17th July at St Paul’s Goodmayes. The commission, undertaken by Henry Shelton, was for a contemporary set of Stations of the Cross which has become known as the Stations of the Crown of Thorns in that, as part of its semi-abstract imagery, Christ is depicted throughout only by the Crown of Thorns. There are 15 paintings in all, as the scheme includes a resurrection Station depicting Christ present in the Eucharistic elements. A tryptich incorporating Stations XI, XII and XIII forms the central focus of the scheme. This tryptich has inventively incorporated an existing metal crucifix into its design to form Station XII; ‘Jesus dies on the cross’. The colour scheme of these ‘Stations’ harmonizes with the existing stained glass at St Paul’s Goodmayes and the paintings feature the minimal flowing lines that characterise Shelton’s semi-abstract style. Parish Priest, Fr. Ben Rutt-Field wrote an original set of meditations to accompany the Stations and these were prayed by Bishop David as part of the Service of Dedication. A networking afternoon featuring members speaking about their work preceded the Dedication. 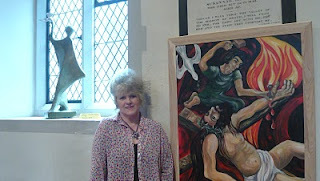 Rosalind Hore and Helen Gould organised a successful Passiontide exhibition held at St Laurence Upminster which featured the work of 15 members. Central to this exhibition was the first showing of a contemporary set of Stations of the Cross by Rosalind Hore. Also on display was work from Rosalind’s series of clay and plaster sculptures. A booklet featuring Rosalind’s Stations was produced for the exhibition. c4m now has an ongoing exhibition space at All Saints West Ham which has been used initially to hang a small group show by a selection of members. This exhibition formed a part of this year’s West Ham Festival at the church. This space enables work by members to be viewed on an ongoing basis and it is hoped that a changing display will include solo and paired exhibitions, in addition to group shows. At our AGM we agreed a Development Strategy researched and prepared for us by Helen Gould. The strategy was based on a survey of members and an external review and includes: registration as a charity; development of regional cells; creation of an advocacy team; and exploration of opportunities for partnership with similar organisations. This work will be taken forward by a c4m committee comprising: Harvey Bradley; Jonathan Evens; Helen Gould; Mark Lewis; Henry Shelton; and Peter Webb. Our thanks go to former committee members Alexander Chaplin and Steven Saxby who stood down from this role at the AGM. The Baptism of Jesus, an oil painting by Rosalind Hore is awaiting installation at St Edmund’s Tyseley. Caroline Richardson has designed two windows on the theme of abundant life for St Peter’s Harold Wood while Henry Shelton is designing etched glass windows for All Saints Hutton. Jewellery maker and conservator Peter Shorer died in June. His life was celebrated at a service held in St John’s Seven Kings. 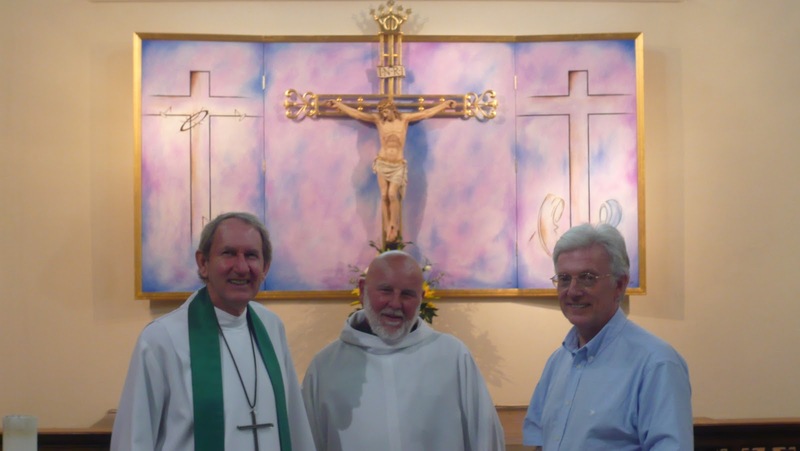 Our webpage includes a tribute to Peter taken from this service. Michael Creasey is a largely self-taught artist, specializing in portraits and figurative work, mostly nudes. He says, “I am not especially a religious painter, as I mainly paint portraits and figure studies, but I do also paint abstract works which tap into emotional and spiritual aspects of my life and reflect my Christianity.” Michael will exhibit at the Visual Arts Centre of Francis Bardsley School, Romford, from 23rd to 27th August. c4m has been successful in gaining funding from London over the Border to develop an Art Trail for the Barking Episcopal Area. Churches have for many years been significant patrons of the visual arts and the Anglican churches in the Barking Area are no exception containing works of art by artists such as Eric Gill, John Hutton and John Piper, among others. Mark Lewis is currently undertaking research for the project and will prepare a leaflet to highlight artists, artworks and churches and to set out the Art Trail created for the Area.